Applied anthropology is becoming increasingly visible and the rise of digital anthropology means cultural research is employed for the development and marketing of technology. However, applied anthropology can also be used as an ongoing research tool for service design as an organic part of the work process. This post examines this option by looking at an enterprise called “The Album People”. The Album People is a London-based service specializing in digital archiving and the preservation of domestic memories. The service was designed as a direct result of a Masters thesis conducted in UCL’s Digital Anthropology department about the future of the family photo album. The ethnography looked at digital archiving practices among Ghanaian families living abroad. 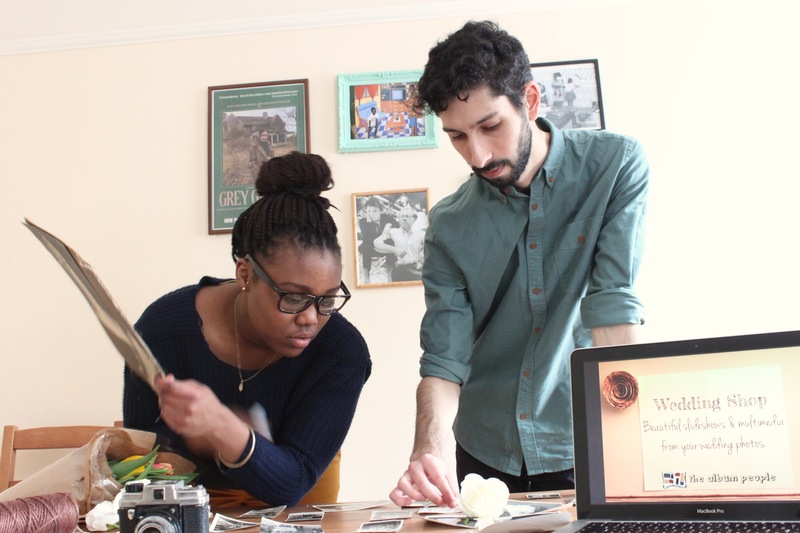 My partner, Alicia Weekes, and I founded it in the hope of helping people build a bridge between their pre-digital and post-digital memories. Our main objectives are to encourage centralization of memories across different platforms, optimize searchability and browsing experience, and preserve materials in sustainable formats and storage outlets according to international digital archiving standards. Although the Album People is essentially a commercial enterprise, our main aim here is to show how services can be designed following social research, and how social research can continue while the service is being provided. By this second stage I mean how we examine the social significance each collection has to its keepers and how it reflects their ideas about family memories. I will elaborate on these two stages to illustrate the significance of social research for user experience and design as an integral force throughout the design process. The role of behavioral psychology, anthropology, and social design in the development of technological products is becoming increasingly visible. Companies such as Microsoft, Intel, and Amazon hire anthropologists to understand the cultural foundations of technological use. As Genevieve Bell, director of Intel’s Interaction and Experience Research, has explained, you cannot invent new products before you understand how people use existing ones . This philosophy guided my anthropological research about the future of the family photo album conducted at the Centre for Digital Anthropology, University College London. I was eager to deconstruct how we think of digital photos and storage in hope of identifying the needs and problems around them. One of my main concerns with previous research about the topic was the extent to which white, middle-class Western families have been observed for the study of digital family photos. For example, studies by Microsoft’s research labs were conducted with English families (mostly based in Cambridge) about memories, home archiving, and photo frames . This frequent choice has to do with the notion that this group has more access to technology, reflects target markets more accurately, and, perhaps above all, represents a neutral community that can provide universal insights about digital technologies. But these notions are far from true and in fact distract us from discovering more challenging insights. That is because we are all influenced by our local culture, norms, and ideals, which differ from place to place. It is often necessary to step out of our supposedly neutral culture and look at someone “else,” in hope of revealing some new truths that can challenge our design process. The group I chose to observe for this goal was Ghanaian families who live in the U.K.
Ghanaian families in the study used digital technology on a daily basis so they can keep in touch with relatives abroad. They also have a tight relationship with photography thanks to the role it played in the British colonial days, as well as during the founding of the Ghanaian nation. By examining the history of the photos from Ghanaian families in our study and how digital tools are incorporated into an existing culture of sharing and remembering, I discovered practices that I later translated into the Album People service. For example, Ghanaian families were often frustrated with their mass of photos and their dispersal between various digital and non-digital platforms. Photos arranged in albums or in random batches, framed pictures, mobile phones, computers, memory cards, and online archives such as Facebook all create a scattered family library that is often unwelcome. Ghanaian families also share a sense of anxiety and uncertainty regarding the “safest” form of storage. 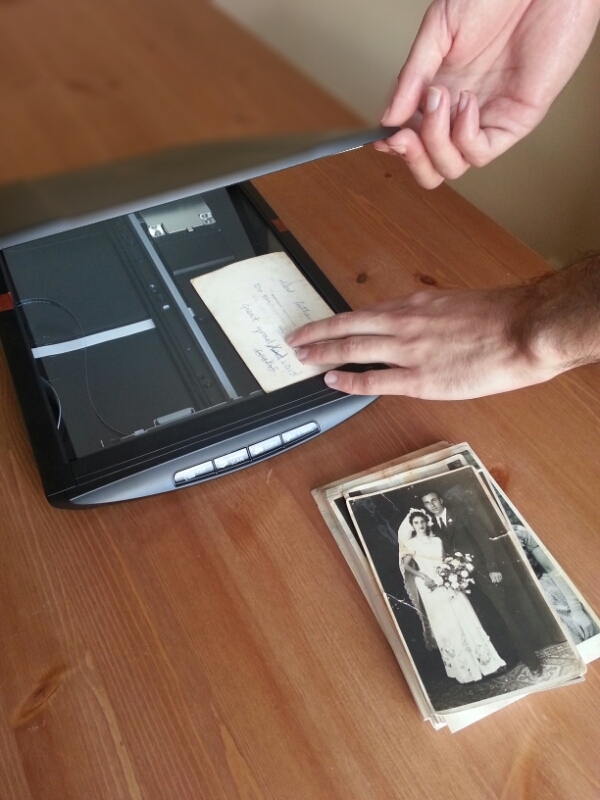 While some families might reject digital storage as a dangerous terrain and opt instead for printing photos, others embrace it as a disengagement from material hazards. Clouds have further challenged these ideas, as they allow immaterial storage but expose photos to privacy- and ownership-related threats. During fieldwork I also noticed that while photo management software (e.g., iPhoto) overcomes issues of browsing and searchability, such tools organize only avatars of the actual files. The real digital files are usually scattered around the computer (e.g., “My Pictures” folder), do not contain textual information, and are not properly archived. This mass of digital photos makes it challenging to navigate between the materials. It was clear to me that there is a need for archiving methods that address the media files themselves. Learning about the universal through the specific of my fieldwork notes was integral to the design of the Album People. For example, I knew right away that home visits to the clients are necessary to make sure the materials do not leave the sight of their keepers and are fully digitized within the safety of their “natural” environment. Another issue I had to tackle was the difficulty people had locating specific photos. Using metadata and tags on the actual files, just like digital archivists do in institutional repositories, means the photo is forever linked to its textual clues and captions. Moreover, these captions are searchable on any computer search bar, which makes it much easier to find actual files. With respect to the actual storage of materials, the Album People uses a dual storage approach that includes both the organization of data in hard drives and curation in an online gallery. The use of fully digital formats in place of DVDs is pretty new in this industry, but fieldwork has showed me that DVDs are perceived as a hybrid digital and analog object that does not solve the problems raised. Furthermore, storing photos online encourages sharing and promotes the social experience around photos, when such an experience is desired. When families express more concern about privacy and safety, high-quality USB sticks stored in cherished boxes created a safe “time capsule” or “vault” feeling for the client. Last but not least, I felt very strongly about the consulting elements of the service and how the home visits I conducted for my ethnography should continue as part of the package itself. When arriving at a client’s home we would have casual interviews to understand the best archiving methods for his or her specific collection. In this sense, the design of personal digital family photo albums required social research not only in the development stage but also as an ongoing value in our day-to-day customer-archivist interaction. Perhaps the more correct term would be social research methodologies and not social research, as my proposal does not call for some sort of info-gathering of customer experience but rather an optimization of the service through a better understanding of their perceptions. How do we organize our digital photos? What do we keep them for? How do environmental elements such as family, location, and lifestyle change our photo-storing needs? These questions cannot really be answered in full in pre-development research. Instead, we must aspire to constantly engage with those questions and use our interactions with living storytellers (in the form of clients) to further improve our understanding of digital family archives. How do we organize our digital photos? What do we keep them for? How do environmental elements such as family, location, and lifestyle change our photo-storing needs? Great aunt’s family genealogy. One of our clients, a career woman with a busy schedule but a strong sense of responsibility toward family memories, hired us to digitize a very old collection kept by her great aunt. As all of the aunt’s family members were dispersed in the U.K., they had no access to the photographs, and since the aunt was not getting any younger, they felt it was essential to preserve in digital formats not only the photographs, but also the stories and information they carry (which were stored only in the aunt’s mind). This challenge required more than mechanical digitization; it also called for in-depth research through interviews and conversation about the individuals in the photos, the dates and locations, and the genealogical structure of the family. Using metadata (captions and keywords embedded in the files), we managed to bridge the immaterial aural information and the material photographs. 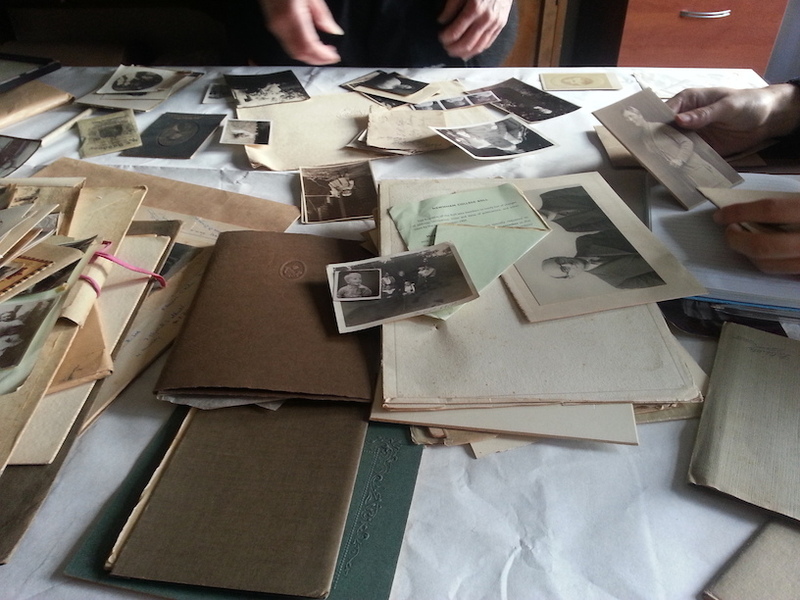 The aunt’s mass of photos was organized in folders that reflected the strongest elements of self-definition in this specific family genealogy. By dividing the family branches into folders and assigning numbers to each folder, the digital library became a type of family tree that guides you through the chronological and genealogical story of the family all the way back to the 1870s. The collection was presented online in a gallery so that family members from across the country could access it. I always find it interesting that the aunt mentioned we have digitized only the photos of the dead and that she will soon invite us to do the same for the living. Chapters of familial life. A very different case involved digitizing a collection belonging to a much younger and smaller family. Young Western families tend to have a weaker bond with their non-immediate relatives and define themselves mainly as a nuclear unit. This influences how their photos are organized, as division by branches is not relevant and there is a need to reflect the chapters and periods of their familial life. The project was booked as a Christmas surprise by the mother (who often ends up as the curator of pre-digital family memories). Before scanning the photos, we sat down with her and sorted the photos into batches. The batches reflected historic segments as she divided them; they consisted of “wedding photos,” “pre-children photos,” “post-children photos,” and “holidays.” Again it was the use of metadata and the digital folder structure that allowed us to design an archive that reflected its keepers. But the only way to know how to design these was through an engaging dialogue with the client. The structure of remembering was incredibly different in this case because it referred to a more immediate personal biography. A simple scanner would never have been enough, and the photos would have ended up messy and disorganized (making them even more likely to be lost than when they were scattered in envelopes and shoeboxes). Pre- and post-immigration. Families who immigrated from the U.K. or to the U.K. are a very interesting case as well. It is easier for family members who lived in one place all their lives to archive their photos and videos by specific events or years. Families who have immigrated or who regularly move countries, however, tend to sort their photos placing less importance on chronological structure and more on geographical structure. We had a client who moved with his family from Singapore to Scotland, and the archive had to reflect this dramatic change. It was clear the archive (and its memories) were often perceived in two terms: “before we arrived in the U.K.” and “after we arrived in the U.K.” The collection allowed the family to navigate between these two significant life periods and made it easier to categorize photos. Families who live abroad also place greater importance on the cloud version of their archive, for it allows sharing and exhibiting with transnational relatives. This is how digital family albums break the boundaries of time and space and encourage a dialogue around memories among various family members. These are just a few examples to illustrate how social research takes part in the design and development of the service, as well as during the actual interaction with clients. I believe it is essential that more sociologists and anthropologists become involved in the world of innovation, as it can dramatically influence how we think of things and people. A company can use social research methodologies either with the help of academics or simply by including a set of values in their toolkit of interactions. Interviews, observation, analysis, and above all, sensitivity to whomever it is that you are serving, can dramatically improve the satisfaction of the customer and the knowledge gathered by the service provider. In the design of family photo albums, which are such personal and unique collections of stories and histories, the role of attentive social research is key. Although the scanners, online galleries, and metadata software are all available to create a digital collection, these have no meaning without the information provided by the curators. They will supply the flesh and blood (dates, locations, names, relations) to the skeleton (folders, tags, hard drives); it was our role to connect them into a meaningful archive. Of course, the world of digital photographs is constantly changing and requires many more solutions. It seems as if people are not sure today which memories to document using cameras and which are not worth capturing at all. Some of our customers expressed difficulty during the consultation stage because it was hard to categorize random photos into collective folders. Highly formalized documentation practices (weddings, births, graduations) are shifting into a more spontaneous and random approach. Mobile phone cameras took this even further and we now document ourselves in any situation, even while eating. How do we go about organizing such photos? Such questions should be asked while keeping a tight dialogue with users of various groups. This dialogue is important because domestic archives contain meanings that go beyond personal sentimental values. By counteracting institutionalized and governmental archives, domestic archives are vital to the preservation of identities and histories in the intimate, free space we call home. 1. Bell, G.‘U are happy life’: Telling the future’s stories. Proc. of the 19th ACM International Conference of Multimedia. ACM Press, New York, 2011, 585–586. 2. Kirk, D.S. and Sellen, A. On human remains: Values and practice in the home archiving of cherished objects. ACM Transactions on Computer-Human Interaction (TOCHI) 17, 3 (July 2010), Article 10.